Well, this is not really a post about recumbent bikes, but it has lot of to do with the recumbent world. Or better to say with velomobile world. 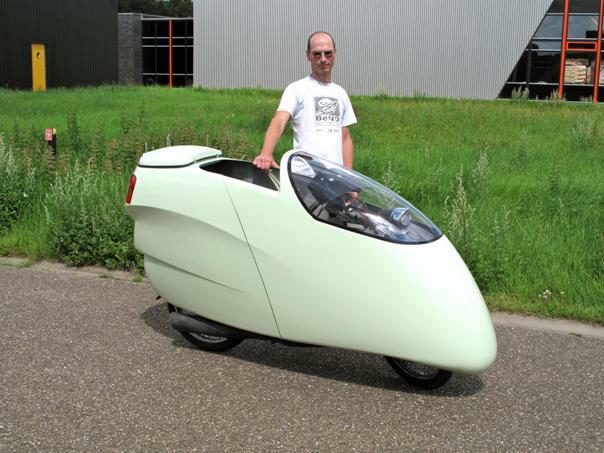 You can see a video here under which describes a fully faired recumbent motorcycle which has been built by Allert Jacobs of Velomobiel.nl. He uses his experience with building velomobiels and made a very nice motorcycle with super low fuel consumption. I especialy like the oveall design and the way it is built as it looks as a vehicle produced in serial production. What I like most are the rear lights from VW Passat. Those are great and fits prefectly.